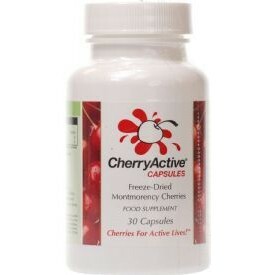 CherryActive capsules are made from 100% natural Montmorency cherries. Take two capsules daily before or after food. CherryActive® capsules are made from 100% natural Montmorency cherries. After pressing the cherries to make the CherryActive® concentrate juice they take the skins and freeze-dry them and mill them into a fine powder. This fine powder allows your body to maximise absorption and protects the concentrated antioxidants within these special cherries. This powder is then capsulated into a 100% vegetarian shell. The freeze drying process removes the naturally occurring sugars (fructose) which makes these capsules an ideal alternative to the concentrate if you have a calorie controlled diet or have diabetes. Each capsule is under 2 calories and is very low in carbohydrates. *Contains naturally occuring sugars only. Montmorency cherries are a tart cherry and as such are significantly high in Vitamin C, polyphenols, anthrocyanadins, anti-oxidants, and relatively high source of melatonin. These cherries have appreciable contents of Vitamin A. Other fruit juices may contain high polyphenols and antioxidants (eg blueberry) but may not offer the full spread of health benefits of the tart cherries. Some of the tart cherries influence the intestinal bacteria and therefore a complementary product could be a broad spectrum probiotic or prebiotics.